Howdy! I am here to share another Crew review with you. 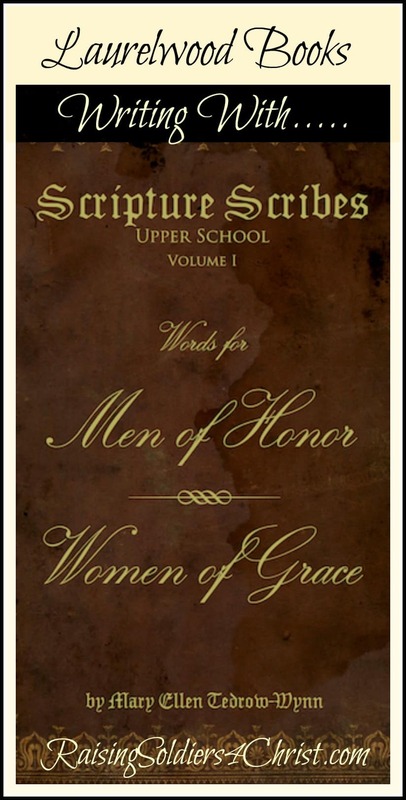 This time I bring you Scripture Scribes: Words for Men of Honor Women of Grace from Laurelwood Books. 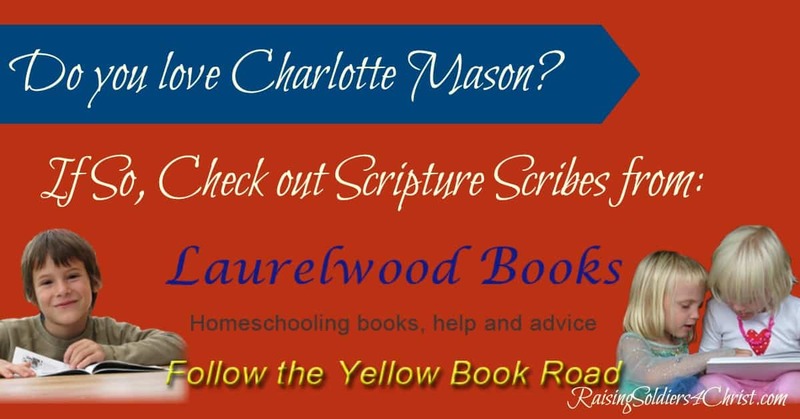 It’s no secret I’m a firm believer and admirer of the Charlotte Mason method of homeschooling. One of the things many things I love about this method is her encouragement of copy work. I believe it is very important to teach children to have beautiful, neat handwriting. However, God blessed me with boys and this task isn’t always an easy one to attain! This is where Laurealwood Books comes in. Laurealwood Books has a variety of options for handwriting. I’ve never heard of this company prior to this review and so far I am very impressed! I plan to get more of their books for all my boys during the fall. For this review, I received Volume 1 of the Scripture Scribes Series. This is the first volume in a three-part series that you can get from Laurelwood Books for $19.95. In case you are interested, the other two books in the series are His Name is Wonderful and One Another. We will be moving on to those in the fall for my oldest. You can Trace, Copy, and Learn God’s Word. A dictionary definition of the character trait. A Bible definition of the character trait. Verses from Scripture about the character trait. Space is also provided for students to trace and copy the quotes and verses. Read and discuss the Dictionary and Biblical Definitions. Trace and copy the quotes and verses. Research one of the quotes. Write a report about one of the traits. Keep a notebook about how the traits are part of your life and how you can improve in those areas. We completed the majority of the suggestions in the guide. However, there are a couple that I plan on saving for the fall as we review and then move on to the next books in the series. Honestly, y’all, I am truly blown away by this series. I love Charlotte Mason, I love copywork, I love quotes, and I always love me some Jesus! Combine them all together and you have Laurelwood Books! This will be our writing curriculum for all my boys this fall. I am truly truly impressed! Also, I have exciting news!!! For my readers – because y’all are so awesome and because Laurelwood Books is so awesome and giving – Laurelwood Books is giving you 20% off!!! This offer is only good through August 15th, 2016!!! So when you head out HERE to Laurelwood Books, enter blogger 121 in the code section when checking out! Also, don’t forget to check out my other crew members reviews by clicking below.